. . .                                           .   .
O Mind! Will you get sadness or grievance when you chant to the elephant faced god Ganesha? Pray to him and you will achieve the desires that dwell in your thoughts. He is the son of Gowri! He is the good fortuned one (Nidhyananthan)!. He is the honest supreme deity (Sathya swarupaa)!. He is constantly revolving in my thoughts and rules over me. I freeze like a statue and hope that you will grant my boons. I bow my head for your blessing and surrender to your feet. Always keep me in your arms and protect me with your shield of kindness. With the blessing of Lord Vinayaka the childhood dream that I envisioned of building a temple for Lord Ganesha came true. 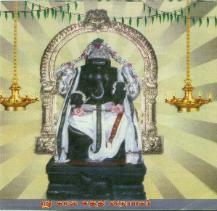 temple for Kamala Siddhi Vinayaka was built at the "Om Santhanandha Swamigal Ashram" in Selaiyur, Chennai.